The best place to turn your winter into an unforgettable experience - Andermatt is a wonderful winter sports resort with many possibilities ranging from skiing to snowboarding, tobogganing, cross-country skiing, snow hiking to cosy horse-driven sleigh rides (there is three toboggan runs with a total length of 16km). Even night skiing is possible in this compact, snow sure and picturesque resort - it is authentic, but with several shops, hotels and restaurants with spectacular service. We can guarantee that you will be impressed by the beauty of 3000m high Gemsstock mountain that overlooks Andermatt ski resort. When looking for transfer provider for memorable ski holidays with your whole family at Andermatt, be sure to check Alps2Alps offer for the best price and service. The history of the resort is over century-long and the resort is a part of the Andermatt-Sedrun ski area and is located in central Switzerland with several airports only 2-3 hours away. It is the largest and modern ski resort in the region largely thanks to the Egyptian developer who invested 1.2 billion pounds to transform the place into a state-of-the-art ski resort with spectacular accommodation offers and world-class ski pistes and service. Andermatt is the paradise for freeskiers and downhill enthusiasts and its luxurious charm attracts more and more ski enthusiasts every winter. Historically even Elvis, Goethe and other celebrities have visited the resort and James Bond scene from Goldfinger was filmed here in Andermatt. Andermatt can be easily reached by train from all the biggest Swiss cities, Andermatt train station is located in the village centre (at Göschenen you will need to switch to branch-line train). Midweek (Monday-Friday) transfer to Andermatt means that the prices will be up to 60% lower than weekend prices - remember, that you can save even more if travelling during the off-peak and off-season. 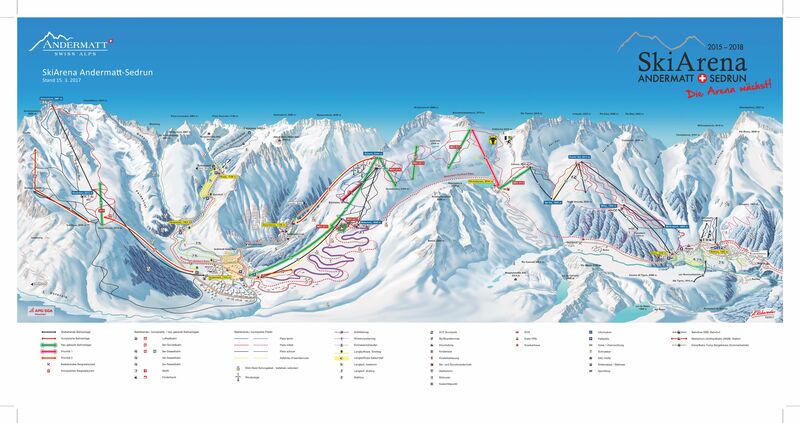 Vehicle utilization and availability, schedule of transfers and other costs like road tolls and parking fees are all taken into account when calculating the final transfer price to Andermatt ski resort. If you are planning to travel to Andermatt as a larger group or there are any other specific needs, get in touch with us directly. Andermatt ski resort is a part of Andermatt-Sedrun ski area giving you extra pistes to explore - a wide range of superb slopes for all winter sports enthusiasts. Andermatt ski resort welcomes thousands of families every day. The ski resort offers discounts for youth, children, students, seniors and of course - families. There are special children snow parks and other activities. ‘’Alpine sports Andermatt’’ ski schools instructors are highly certified and specializes in high-performance ski improvement for children and adults. The village itself offers a wide selection of mountain restaurants and bars to relax and enjoy the local atmosphere. Andermatt ski resort with its authentic style and beautiful buildings attract thousands of people every year. Therefore we highly recommend booking your transfer in advance. It will also guarantee you the best possible price. Alps2Alps are here to provide you with the best service, thus your ski vacation can start on a high note!